Coach Cloe Hedlund, Kaysha Unruh, Bethany Schott, Nicole Casebeer, and Coach Tawny O'Hara. After four seasons as the assistant coach, Cloe Hedlund will take the helm as Canton-Galva’s head volleyball coach this year. “We are looking forward to working on some new offensive and defensive plays; hopefully we can implement them effectively this season,” she said. The Eagles are short on players, though, and are already dealing with injuries, so the start of the season might be challenging. For the season, Canton-Galva will lean on seniors Kaysha Unruh and Nicole Casebeer, along with junior Tia Moddemog for leadership. 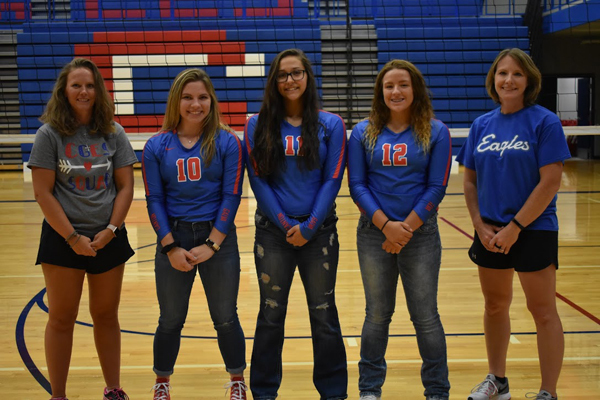 Juniors Carissa Klatt, Megan Malbie, Jayci Mastre, Bethany Schott, and senior Bethany Schott round out a team of upperclassmen.